We love pistachio nuts. We love the green color, and we love the taste. 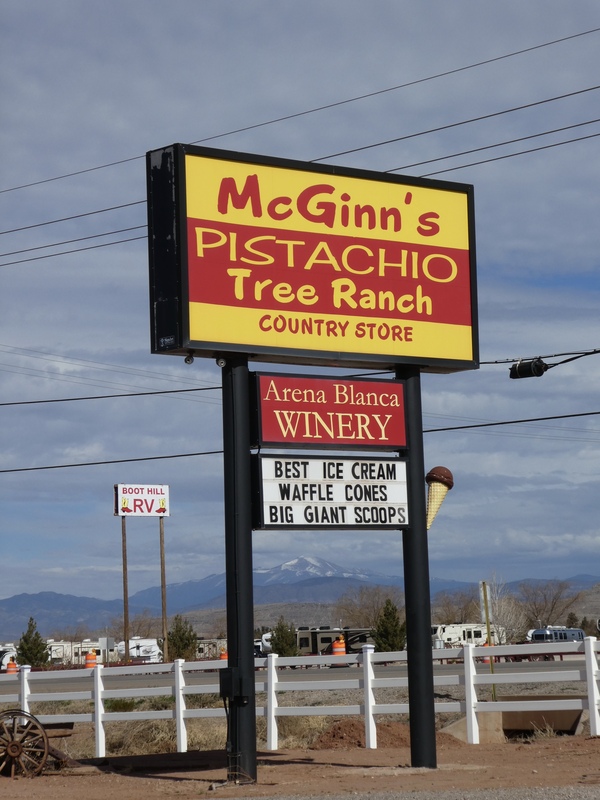 In Alamogordo, New Mexico, we visited McGinn’s Pistachio Tree Ranch and Winery. But, are pistachio nuts really 30 feet tall? 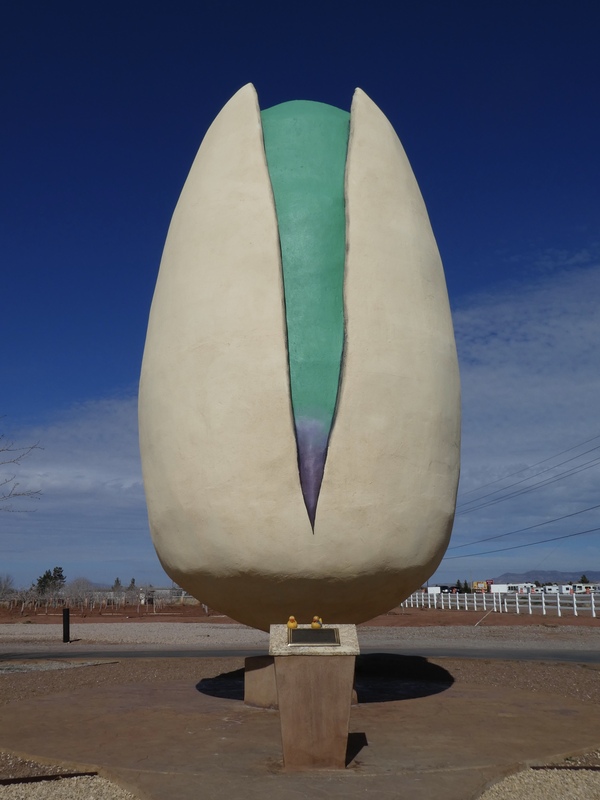 This is the world’s largest pistachio nut. It is 30 feet tall, made from 5 yards of concrete and then colored with 35 gallons of paint. When the founder, Mr McGinn, died, his heirs had this pistachio nut created. They remember as kids they would travel around the country with him, always stopping for these oversized, roadside attractions. 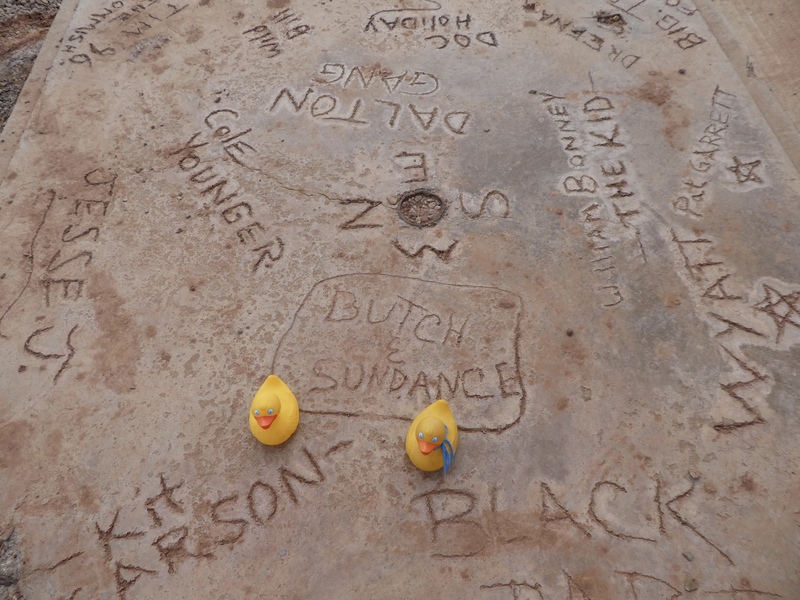 We ducks have seen a lot of these attractions also, and we always are amazed by what we find. But, back to Alamogordo and this pistachio farm. The building is huge, housing equipment, gift shop, small cafe and lots of storage. PistachioLand is the name, but there are also vineyards here. Our first activity was a tour of the farm. Tour bus. Soapy’s dog Chloe went on bus with us. These ladies were so friendly and so smart. Our moms were the only humans on this tour, so Soapy’s dog, Chloe, was also allowed to go with us. First we saw the vineyards. 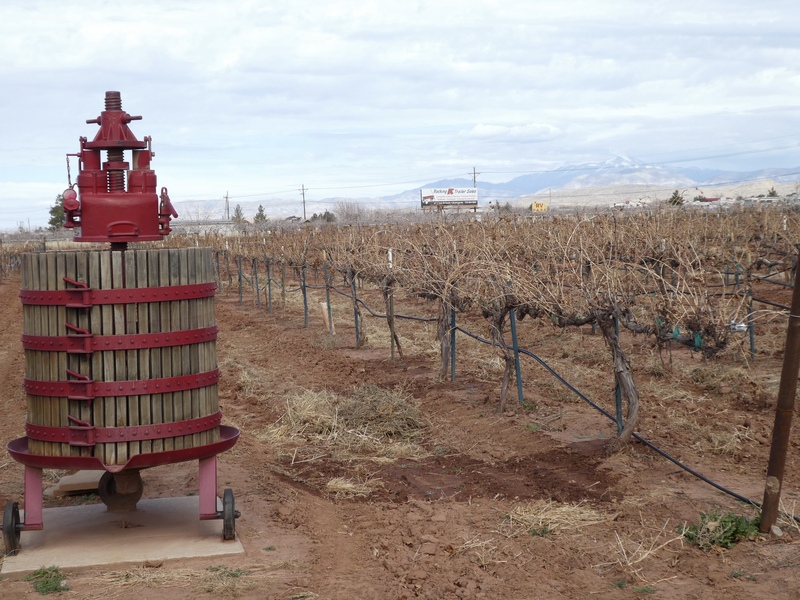 Seven types of grapes are grown here and they press the grapes and produce their own brand of wine. Continuing, we saw acres of pistachio trees. You may notice the irrigation hoses on the ground. Remember, southern New Mexico is mostly desert. These pistachio trees are grafted. There is a university in California that has trees that do well in this climate. 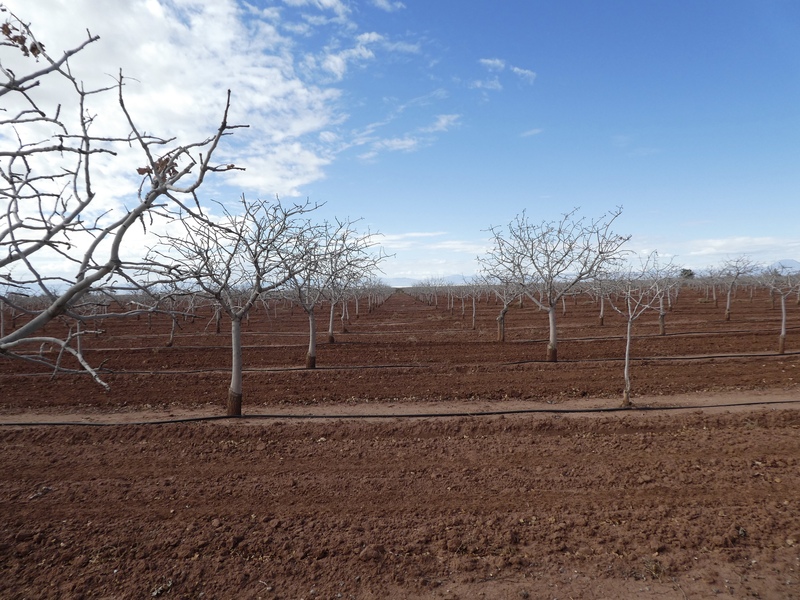 Pistachio trees are grafted onto these trees, creating hardy Pistachio trees that thrive in the desert of New Mexico. After our enjoyable tour, we headed towards the gift shop. We see that ice cream cone. 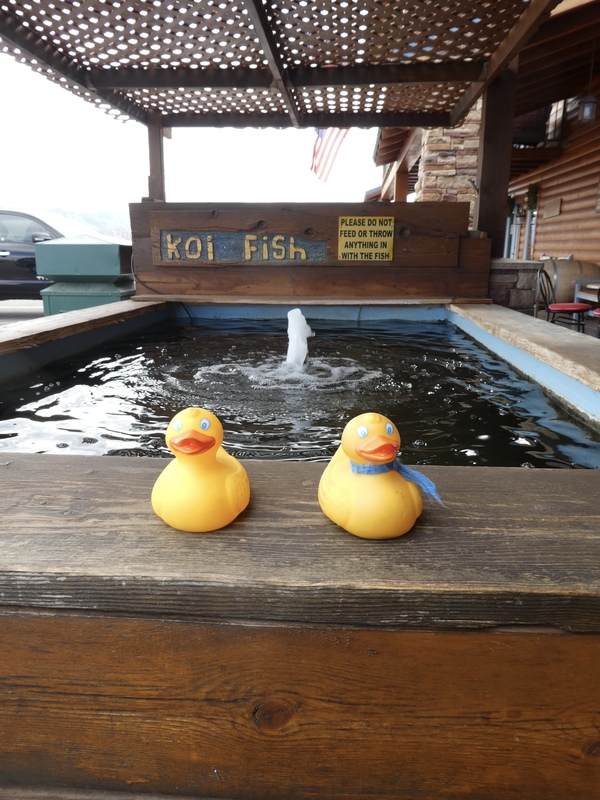 Near the entrance, we stopped at the Koi fish pool. We love water and we love watching the fish. 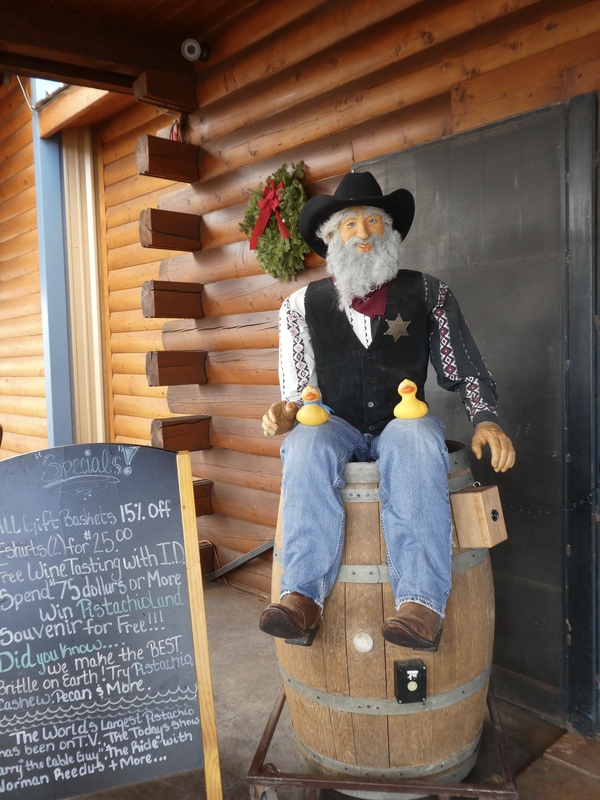 We ducks are sitting here with the sheriff. He is telling us stories. At the end of the long porch is a patch of cement. 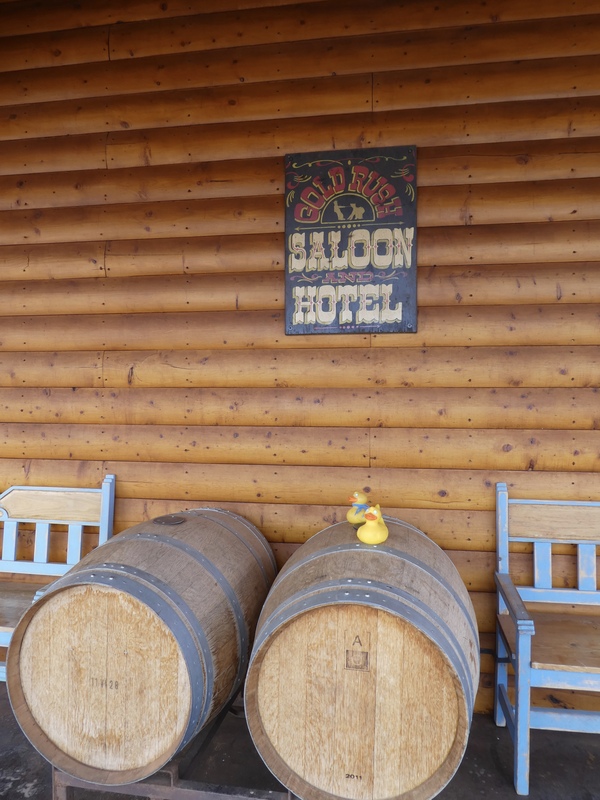 Adding to the rustic atmosphere, we are sitting on wine barrels, under the sign for the Saloon and Hotel. Inside the gift shop, we found normal souvenirs of t-shirts, post cards, refrigerator magnets, and many fascinating items. Also a nice collection of regional cookbooks, many flavors of salsa and sauces, and wines. There was a sampling table of candy, most with pistachios. We especially liked the pistachio brittle. Soapy’s mom liked the chili pistachio candies also. Another section had old signs and this 1940 Ford. We like this gift shop and we really liked all the people we met. But, now it was time for the serious stuff. Remember the ice cream. We didn’t want sandwiches or any other food, just ice cream. Each human got 2 scoops of ice cream (huge scoops) in a waffle cone. Mom had some with pistachios. Soapy’s mom had some with chocolate. We went outside so Chloe, our dog, could join us. The ice cream was delicious. 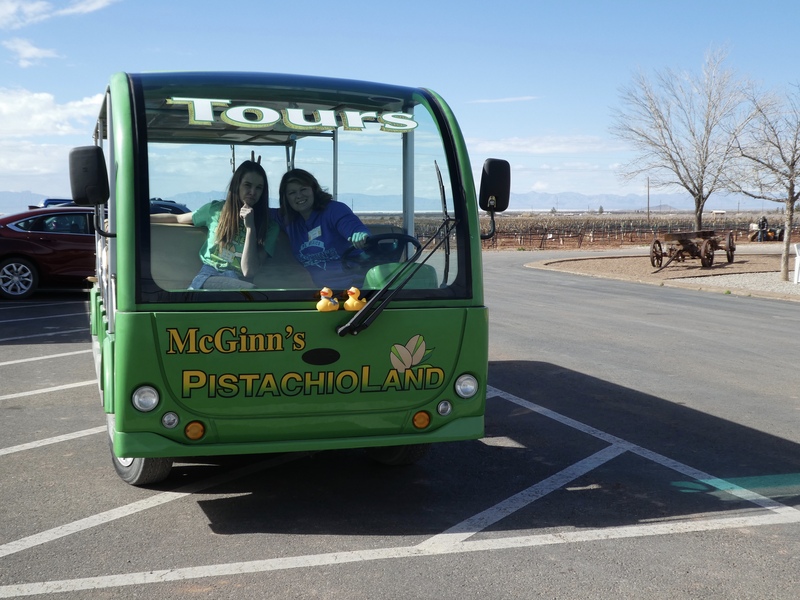 We had a great time here at McGinn’s pistachio farm. 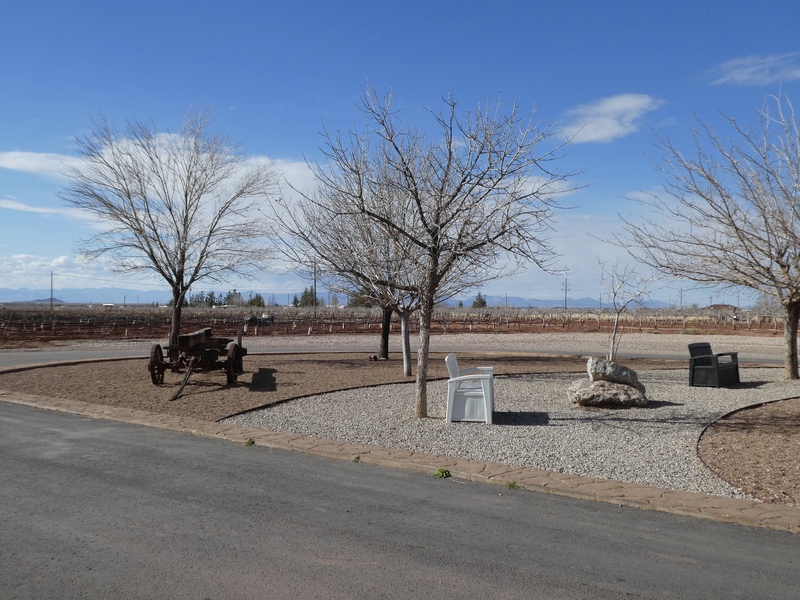 When you are near Alamogordo, we hope you will stop. The tour was good, the atmosphere fun, the gift shop incredible and the samples are tasty. 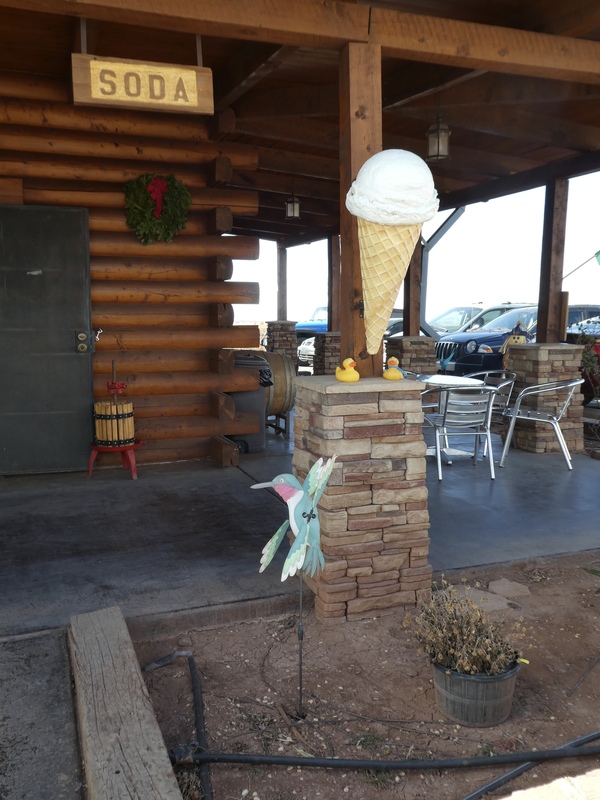 The ice cream was a bonus and a reason to stop here on a warm day. Next time we are in Alamogordo, we will stop here. Maybe we will see you. 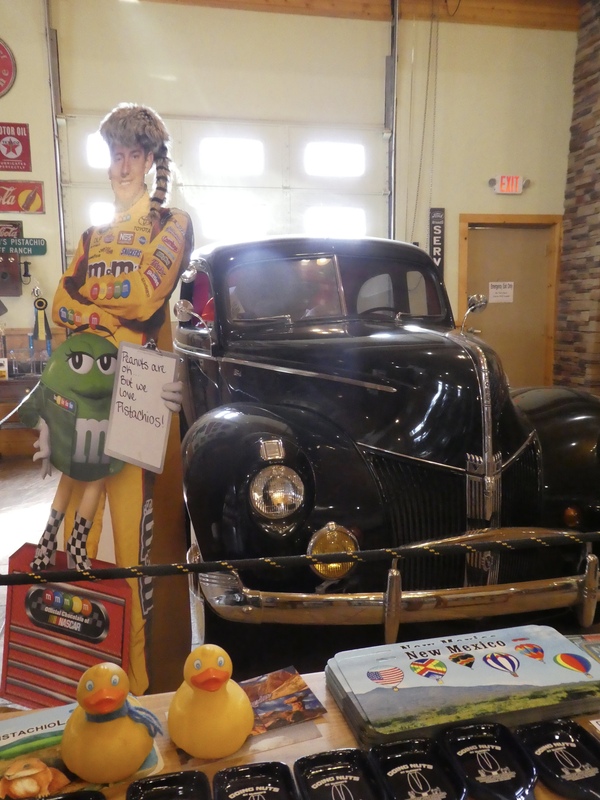 This entry was posted in New Mexico, Uncategorized and tagged 1940 Ford, Alamogordo, Colorado Traveling Ducks, ice cream, Koi pond, McGinn's Pistachio Farm, New Mexico, pistachio candy, pistachio trees, vineyards. Bookmark the permalink. That is so cool that you got to tour the farm! It was a lot of fun, and interesting. I was hoping to see the giant scoops of ice cream – did you forget to take photos before you gobbled it up? What a fun place to visit and how interesting to see the trees growing in such an arid environment. It is an interesting place. Gift shop was nice and samples of some of the pistachio food. And, yes, we ate the ice cream before I thought about photos. It looked great and was ceertainly delicious!